KABC health reporter Denise Dador highlights the heroic efforts of UCI Health experts to care for an expectant mother who discovered she had pancreatic cancer. The story aired on KABC-TV 7 during the 11 p.m. newscast on Thursday, May 8. Thirty-six year-old Karalayne Maglinte was basking in the joy of her third pregnancy when she started experiencing strange symptoms around the 15th week of her pregnancy. She felt excessive itching of her hands and feet and soon developed jaundice. Within weeks, tests confirmed unimaginable news. She had pancreatic cancer. Maglinte and husband Dennis made the difficult decision to undergo surgery, her only treatment option to remove the malignancy, during the 21st week of her pregnancy. Surgical oncologist Dr. Aram Demirjian, a specialist in treating the pancreas, performed a seven-hour operation to remove the pea-sized mass. Known as a Whipple procedure, this surgery is the most common operation to treat pancreatic cancer. It is extraordinarily rare to perform on a pregnant patient: Fewer than 10 cases are known and only two known pancreatic cancer cases. The decision turned out to be life-saving, not only for Maglinte but also for her daughter. The cancer was confined to a small part of the pancreas. Maglinte continued to be monitored by UCI Health experts in maternal-fetal medicine until she delivered a healthy, nearly full-term daughter. Maglinte is now in remission and celebrating the recent arrival of baby Emlee. 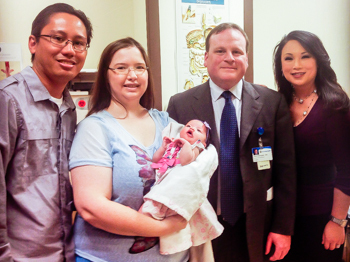 Photo: From left, Dennis Maglinte, Karalayne Maglinte holding newborn daughter Emlee, Dr. Aram Demirjian and KABC health reporter Denise Dador.